Maqui berries have long been revered by the Mapuche, the indigenous people of Central and Southern Chile. The Mapuche attributed their strength, health and longevity to this small purple-black berry. Maqui was traditionally used in the daily diet, in medicinal preparations and in the rejuvenating fermented tonic known as Chicha. Maqui is a source of Vitamin C and a host of antioxidants giving it an ORAC value of 3,000 per 1 teaspoon 4g serving. The ORAC value is a measurement of the antioxidant capacity of different foods. Antioxidant flavonoids known as anthocyanins give Maqui berries their striking purple pigment. Not all Maqui berry powders are the same. Organic Traditions offers the highest quality Maqui available. 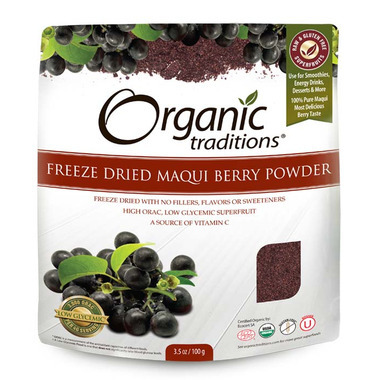 Organic Traditions Maqui powder is a Certified Organic concentrated freeze dried powder. This process ensures that the delicate vitamins, minerals and antioxidants found in the berry are not degraded. There are no fillers, flavors, maltodextrin, binders or sweeteners added, just pure concentrated Maqui with the most delicious, freshest taste!